You’ve trained. You’ve tapered. 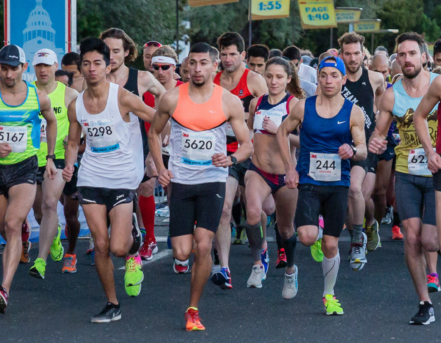 You’re ready to unleash the power and set a PR for some of the big races coming up like this weekend’s 3M Half Marathon (January 20, 2019), and the Austin Marathon and Half Marathon, set for February 17, 2019. But are there things you can do to improve your times on race day itself? The answer is yes, and here are some suggestions. Visualize how you’re going to run your race. Sounds hokey, but it works. When you do this, really get in the moment: see and feel the whole experience. Use all of your senses and visualize how it feels on different parts of the race course. Know the course and use it to your advantage. 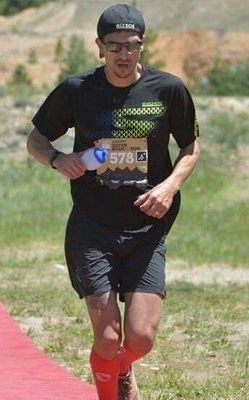 Are you a strong downhill runner? Work those downhills! Does the course have a tough section to it? Be mentally prepared for that, and relax through it, knowing you have plenty left. Is the finish line hidden behind a sharp turn? Knowing that, you’ll be prepared for your kick. Wear the right shoes for the occasion. Remember when you were a kid and you got new sneakers and thought you could actually run faster because of them? Well, wearing the right shoes can shave seconds off of your time. And PRs are made by seconds. For example, if you own a pair of racing flats, the lighter feel can spur you on to a slightly quicker leg turnover. Or if you know the course has lots of downhill, you may decide to wear your more cushioned pair, understanding that you may gain a few seconds coming down those hills. Remember: PRs are defined by as few as five to 10 seconds! Pace, pace, pace! Don’t fool yourself. While there’s nothing wrong with being ambitious and feeling the spirit of the occasion, only you now what pace it realistic for yourself. Stay within the range you’ve trained for. Have a goal and strive for it. This is incredibly important. It’s where the mental aspect of racing comes in. 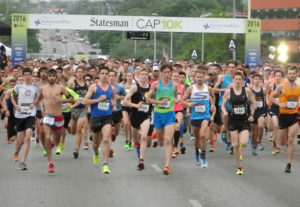 The ability to prove to yourself that, yes, you can break 1:30 for the half marathon, or yes, you can break three hours for the marathon can be a compelling driving force that positively affects the outcome of the race. It’s OK to be negative. Pace, that is. Time and time again, studies have shown that running even, or negative (slightly faster second half of the race) splits is the most economical strategy in terms of energy expenditure. While this sounds easy, it requires a good feel for your fitness level, and a healthy dose of discipline. Use your rivals for inspiration. One of the main differences between training and racing is that you’re competing with others during a race, not just yourself. You can use that to your advantage. If you spot a rival just ahead of you, reel him or her in over the miles, and make it a goal to pass him. In this way, your opponents can actually make you run a better race! Incorporating all, or even some of these strategies on race day may just get you that PR you’ve been training for! Upcoming Races: Saturday, January 26, Tutus and Tennies 5K at 7:30 a.m., 1019 Main St. in Buda. Saturday, January 26, Cheetah 5K Run, at 8:00 a.m. at 5 Mile Dam Park, 4440 S Old Stage Coach Rd. in San Marcos. Saturday, February 2, Cupid’s Chase 5K, at 8:00 a.m., 7th and Main St. in downtown Georgetown. ©2019 Ready to Run | Coded with by Break Free Graphics, Inc.